Of Indonesia’s 100 GW in new power generation capacity by 2035, half will be coal-fired, says IEA. Indonesia cannot build power stations fast enough. And neither can most of its Asian neighbors. Rapid economic and population growth are driving equally rapid demands for electricity as the region builds out power grids to connect up millions of people to fuel prosperity. Electricity generation is forecast to nearly triple in Southeast Asia between 2011 and 2035, the International Energy Agency says, with fossil fuels providing most of the energy. With a population of 600 million, nearly twice that of the United States, and about 130 million people without electricity, Southeast Asia faces an immense challenge to meet that demand in a cost-efficient manner that doesn’t cause serious air and water pollution and drive up health costs. 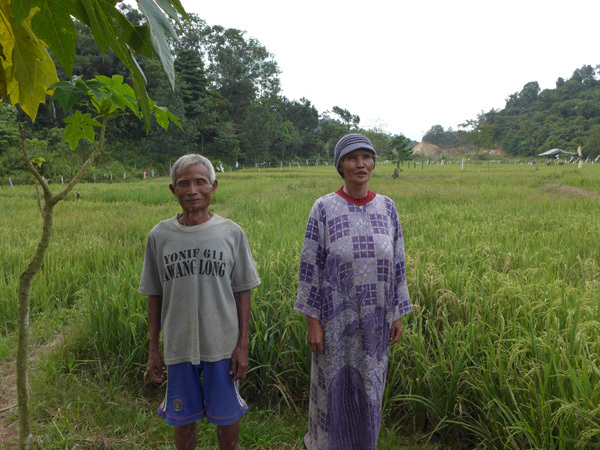 Rice and rambutan farmers Komari, 70, and his wife Nur Bety, 60, say an adjacent coal mine has disrupted water supplies, leading to water pollution and reduced yields. Loss of local forests for new coal pits has increased insect and monkey attacks on their crops at Makroman village, near Samarinda, East Kalimantan. Photo by David Fogarty (August 2014). For Indonesia, the Asia energy story is a blessing worth untold riches in terms of royalties, money it needs to develop its economy and provide jobs. The IEA says demand for coal in Southeast Asia will rise 4.8 percent per year, with Indonesia in the geographic sweet spot to be the region’s main supplier. In the wider Asia-Pacific, demand for coal will increase by 52.8 percent from 2010 to 2035, according to the Asian Development Bank. With about 30 billion metric tons of coal reserves, according to the Ministry of Energy and Mineral Resources, Indonesia has decades’ worth of supply to fuel its economic expansion and that of its neighbors – provided it limits production growth. “Coal is still going to be the most significant fuel in the energy mix for the foreseeable future,” said Sacha Winzenried, a senior adviser on mining for PwC, the global business services firm, referring to Indonesia. While Indonesia has large amounts of gas, it doesn’t have a national pipeline network, he said, and it will be hard for renewables, such as geothermal, to dramatically ramp up capacity fast enough because of high capital costs. It is here that Indonesia faces its trickiest energy balancing act: how to ensure enough coal supplies to meet soaring domestic energy demands, while also meeting the growing needs of its neighbors and facilitating growth expectations of domestic coal producers. Environmentalists and climate scientists also point to damage from coal mining and growing carbon dioxide (CO2) emissions that will undermine the drive to limit global warming. As a result of efforts to do so, major developing countries are under increasing pressure to limit emissions growth. More coal mining will mean more deforestation, since most Indonesian coal extraction is done through open pit mining. This involves clearing forest or farmland, removing the top soil and then progressively digging out the coal seams, which can be a few metres to tens of metres from the surface. Once the coal is extracted, the top soil is backfilled into the hole and a new pit is dug. 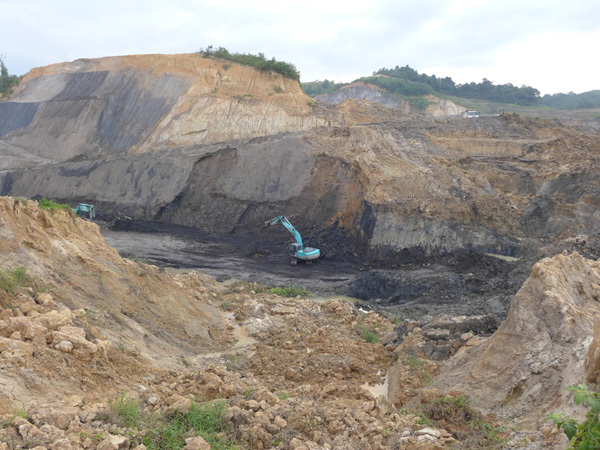 Excavators dig out coal at a mine adjacent to Makroman village, near Samarinda, East Kalimantan. Villagers say the mine has disrupted water supplies and cut yields for rice and fruit crops. The mining company wants to acquire the village area but most villagers refuse to sell their land. Photo by David Fogarty (August 2014). Increased mining will also result in more water pollution and health risks for local communities, NGOs say. They point to myriad environmental and health problems caused by the industry to date because of poor oversight and corruption. Common examples of graft involve district chiefs offering mining permits in return for bribes and police and mining department officials ignoring threats and intimidation of villagers by mining firms seeking to acquire land. For Indonesia, though, there is little choice, the government says. In the world’s fourth most populous nation with 250 million people, 60 million of whom do not have access to electricity. The nation has 54.5 gigawatts (GW) of installed capacity, about the same as neighboring Australia, a country with a tenth of Indonesia’s population. Electricity demand growth in Indonesia is increasing 9.4 percent a year, according to state utility Perusahaan Listrik Negara (PLN). Abundant coal is the quickest way to connect millions of people to electricity and drive economic growth, the government says. The central government is trying to address environmental issues, with mixed results. For now, its primary focus is energy security, particularly as production at its existing oil fields declines, leading to more oil and fuel imports. It is also trying to clamp down on illegal mining and halt illegal exports estimated by the government at a minimum of 50 million to 60 million metric tons per year—an embarrassing loss that is costing hundreds of millions of dollars in royalties. The Ministry of Energy and Mineral Resources wants to cap coal production at around 450 million metric tons year, said Bambang Tjahjono, the director of coal business supervision at the ministry’s Directorate-General of Mineral and Coal. Indonesia officially produced 421 million metric tons of coal last year, about 350 million of which was exported. Over the past decade, total output tripled, data from the ministry shows. That level of growth has to stop, said Tjahjono in an interview at his office in Jakarta. Chart made from data published in the Handbook of Energy and Economic Statistics of Indonesia, 2013. Background photo by David Fogarty. Click to enlarge. 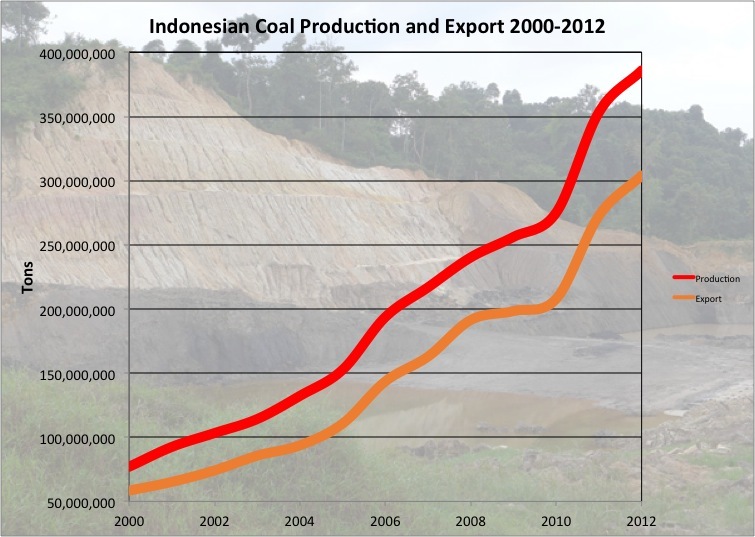 “For Indonesia, we expect coal production, for the next five to 10 years, is still the same. We assume in 2015 we will have flat production, so zero growth. We plan to have 449 million tonnes for the next five years and the next 10 years,” he said. “Coal utilization in Indonesia will increase. Maybe four percent [per year]. So the exports will be the same or decreasing, but the domestic consumption will increase. That’s the prediction,” he said. He added the ministry was working on a regulation that would enshrine the cap and he hoped it would be approved later this year. Tjahjono said the cap would be enforced. The government already approves the annual production plans for all major coal miners in Indonesia and can cap or even trim these if the mines exceed approved production plans. Winzenried said the current low global coal prices also discouraged allowing higher production, because coal royalties were based on total sales. “It’s no longer production at all costs,” he said. Tjahjono expects production this year to be 407 million metric tons, in part because of low prices, but also because of new trade rules aimed at stopping illegal exports. Lower demand from China is also curbing some sales. Already there are signs the global coal market is picking up and this will likely challenge the government’s resolve to cap production, given coal royalties are worth billions of dollars every year. State utility PLN says Indonesia must ensure domestic coal supplies and also supports curbs on export growth. It forecasts Indonesia’s coal demand for power generation will grow from 73 million metric tons in 2014 to 151 million in 2022, as coal’s share in the total fuel mix rises from 53 percent to 66 percent. The IEA forecasts Indonesia’s electricity demand will triple between 2011 and 2035 and will need to add 100 GW. The government has also recently changed its mining laws that require value-added processing to minerals before export. This will mean mining firms will have to build energy-hungry smelters, another source of coal demand. Capping coal production will also upset coal miners, some of which have ambitious production and investment plans. PT Adaro, one of Indonesia’s largest and most profitable coal mining corporations, expects to produce between 54 and 56 million metric tons this year, up from 52.3 million in 2013, and has a medium-term forecast of 80 million metric tons. The company, in an investor presentation in September this year, said it saw immense opportunities in exporting to the rest of Southeast Asia. It expects coal consumption in the region to rise from 214 million metric tons in 2013 to 600 million in 2030. Nearly half that demand would come from Indonesia. It also expected demand from China to wane, while Indian demand would grow over the coming decade. China is looking to impose a national cap on coal consumption and ban the import of low-quality coal under a draft pollution law released recently. On October 9, China announced it would impose tariffs on minerals, including coal, from Oct 15, though Indonesian coal is exempt because of a regional trade agreement. “Coal demand in China might slow at some point in the next decade. However, that is the time when India’s energy requirements will peak, compensating any potential downfall,” the company says in the presentation. Reclamation work at the PT Kitadin mine, majority owned by Thai firm Banpu, near Samarinda, East Kalimantan. Photo by David Fogarty (August 2014). Adaro expects that out of the expected total growth of 250 GW in new power generation capacity by 2030 in India, around 160 GW will come from coal. However, it is unclear how a decision late in September by India’s Supreme Court to cancel 214 coal permit allocations will affect power station investment plans. Rapid investment in solar could also weaken demand for coal in India. Another Indonesian coal miner, PT Bukit Asam, is even more bullish. In a June 2014 conference presentation, it cited research by market analysts Wood Mackenzie, which forecast Indonesian coal production would reach one billion metric tons by 2035, with domestic coal consumption about 350 million. That level of production, though, would rapidly eat away at Indonesia’s coal reserves, currently estimated at about 3 percent of the world’s total. For the moment, Indonesia’s largest overseas customers are India, China, South Korea, Japan and Taiwan, but demand from Southeast Asia is expected to pick up quickly. Adaro and global miner BHP Billiton are investing in what could become one of Indonesia’s largest coal mines. 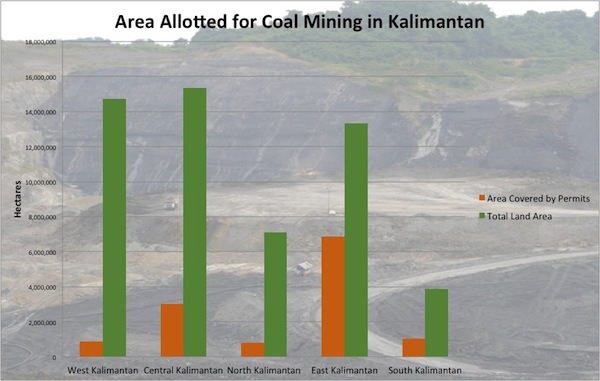 The IndoMet mine complex on Borneo covers about 350,000 hectares across seven coal mining concessions in Central and East Kalimantan provinces. It is estimated to have 1.27 billion metric tons of coal resources, mainly coking coal used to make steel. 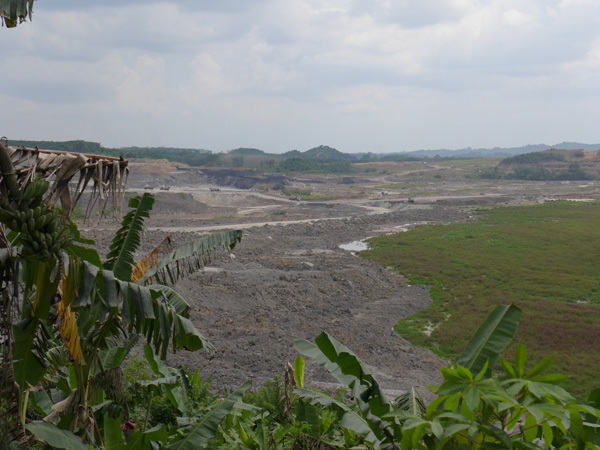 The environmental group Indonesian Forum for the Environment (or Walhi) says the mining would occur in a heavily forested area where smaller mining operations have already polluted local rivers. They fear such a large mine could be the trigger for a $2.3 billion coal railway in the province, which in turn could prompt other mines to be developed. 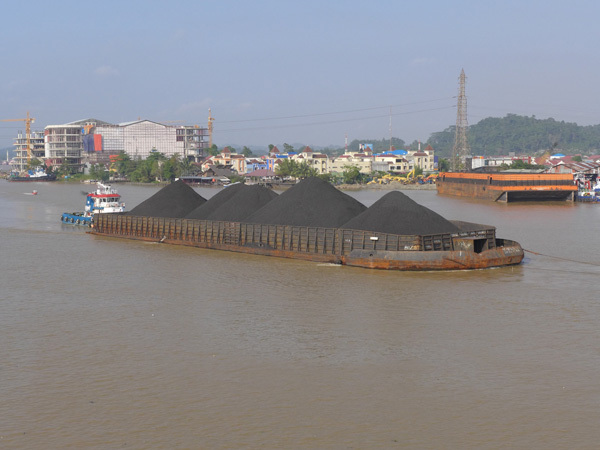 Coal produced in the north of Central Kalimantan is currently shipped hundreds of kilometers down-river by barge, a costly and time-consuming process. Coal barge on the Mahakam River, Samarinda, East Kalimantan. Photo by David Fogarty (August 2014). Australian mining company Cokal, in a June announcement to the Australian Stock Exchange, said it had received in-principle approval from the ministry of forestry to proceed with its plan to develop part of its majority-owned Bumi Barito Mineral Coal Project covering nearly 15,000 hectares. The BBM project is next to one of IndoMet mine’s concessions. The company hopes to eventually produce six million metric tons of coking coal per year. The central government and the Central Kalimantan authorities have accepted a Chinese-led consortium’s bid to build the 425-kilometre (266-mile) rail project, but have yet to grant final approval. The railway would start in the north of the province at Puruk Cahu on the Barito River. “If you visit Central Kalimantan, you don’t see many forests in the southern, lowland areas,” said Walhi’s head of research, Pius Ginting, pointing to large-scale logging and deforestation for palm oil plantations. “But this mine is in the northern part. The last areas of forest are there and the communities depend on the forest. We are really concerned about this. I think BHP is the biggest beneficiary, so if BHP goes there, the coal railway will go there. And this will facilitate all the other mining permit holders to open their areas,” he said in an interview. Data from the Ministry of Energy and Mineral Resources shows that as of last year, there were 543 coal mining permits of all types in Central Kalimantan covering 3 million hectares, or one-fifth of the province, underscoring the risk from coal mining expansion. Indonesia does have energy alternatives, NGOs and green energy investors say. They want the government to focus more on renewables, such as wind, solar, geothermal and hydro, as a hedge against too much dependence on coal. Greenpeace Indonesia has calculated that with regulatory support, renewable energy could comprise 50 percent of Indonesia’s energy mix by 2035. At present, hydro comprises 5 percent and geothermal 4 percent, according to PLN. Geothermal is forecast to rise to 11 percent of generation by 2022, PLN says, while hydro stays steady at 5 percent. Indonesia boasts about 40 percent of the world’s geothermal resources, but high construction costs remain an obstacle. Solar and wind are looking increasingly attractive, particularly in remote areas, as costs fall. Wind and solar investment remains tiny, but that is changing. Asia Green Capital Partners, a company developing renewable energy projects, is seeing positive signs of change from PLN. The government is working on a feed-in tariff for wind power projects and tendered 140 MW of solar power projects for remote islands, triggering a strong investor response. “We believe in 2020 the potential would be 1 GW of wind energy for Indonesia, growing to 10 GW by 2060, which is due to growing grids and improvement in technology that allows us to build wind farms in lower wind speed areas,” said Asia Green Capital Partners’s project development director, Thijs Sablerolle, in Jakarta. 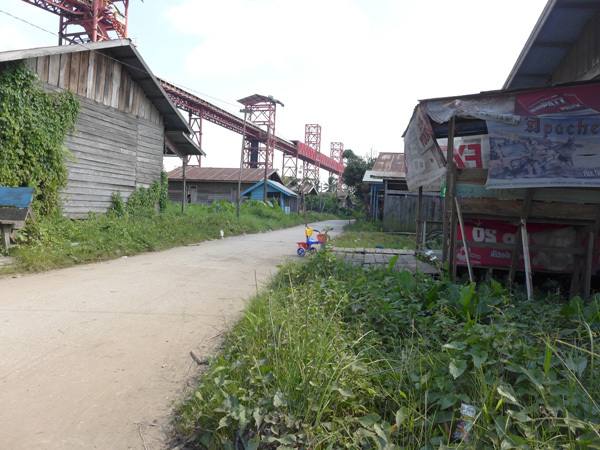 A coal conveyer belt system rises above the village of Bakungan, near Samarinda, East Kalimantan. The coal is loaded on the conveyer belt from an adjacent coal stockpile and then loaded on to river barges nearby. About half the houses in the village are empty, bought by a local coal company. For the residents who remain, they have to live with the constant smell of coal dust. Photo by David Fogarty (August 2014). Singapore-based Asia Green Capital Partners has teamed up with the IFC, part of the World Bank, to develop a 62.5 megawatt wind farm in South Sulawesi. Other projects are in the pipeline. At present, PLN uses costly diesel generators in many remote areas in Indonesia and is building small coal-fired power stations on some eastern islands. Solar could provide a cost-effective solution, Sablerolle said. PLN, though, has yet to sign power-purchase agreements for solar projects. This cautious approach contrasts with the government’s fossil fuel subsidies that currently consume about one-fifth of its annual budget. While renewables investment is set to grow in Indonesia, coal-fired generation will remain the main focus for the government. Greenpeace estimates there are 117 coal-fired power stations either planned or currently under construction. Not all will get built, either for financial reasons or local protests. But based on projections by the government, IEA and ADB, rapid coal-fired power generation investment will cause a sharp jump in Indonesia’s and Southeast Asia’s carbon-dioxide emissions. “The region’s energy-related CO2 emissions almost double, reaching 2.3 billion [metric tons] in 2035,” says the IEA in its Southeast Asia Energy Outlook 2013. Of Indonesia’s 100 GW in new power generation capacity by 2035, half will be coal-fired, says the IEA. According to the Global Carbon Atlas, Indonesia’s fossil fuel emissions from burning oil, gas and coal and cement production totalled 263 million [metric tons] in 2000, rising to 494 million in 2013. Over the same period, coal emissions rose from 42 million to 171 million metric tons. The rise in emissions directly challenges the government’s goal of cutting greenhouse gas pollution by 26 percent below projected business-as-usual levels by 2020. Add to this Indonesia’s increasing deforestation rate, according to recent studies, and annual forest fires. According to the government, about 75 percent of Indonesia’s greenhouse gas emissions come from deforestation, forest fires and clearing and draining of carbon-rich peat swamps. According to data from Global Forest Watch, Indonesia lost more than 15.5 million hectares of tree cover from 2001 through 2012, representing more than a tenth of the country’s forest cover. Nearly all forest loss–15.1 million hectares–occurred on Sumatra, Kalimantan, and Sulawesi (shown). However, some of this detected forest loss is likely due to the harvesting of plantations. Still, large swaths of once-intact forest landscapes have been degraded since 2000. Map courtesy of Global Forest Watch. Click to enlarge. Areas allotted under coal mining permits (not pictured) add to islands’ landscapes that are already dominated by timber, palm oil, and wood fiber concessions. Map courtesy of Global Forest Watch. Click to enlarge. Given rising fossil fuel emissions, the government would need to dramatically rein in forest loss and curb forest fires if it is to achieve its 2020 climate goal. Greenpeace says the government has to get its coal production policies right and that NGOs will be turning up the heat on the coal sector to curb production, with campaigns targeting financiers and buyers. For ordinary Indonesians, the growth of the coal sector means it is just one of a long line of resource industries that compete for land, placing ever greater demand on the nation’s dwindling forests and farms and customary lands as the population heads towards 300 million by 2035. Mining concessions of all types already cover about 34 percent of the country. Coal mining concessions alone cover 21.25 million hectares, or about the size of the U.S. state of Kansas, according to government data. If you include oil and gas, palm oil, timber and logging concessions, it is 68 percent of the country. 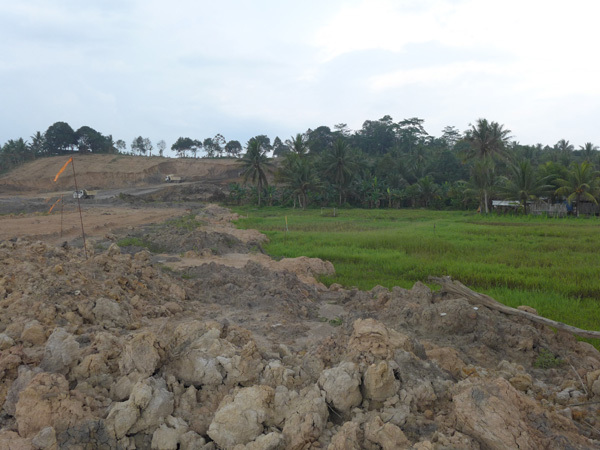 Farmland is cleared as work starts on new coal pit at PT Kitadin mine, majority owned by Thai firm Banpu, near Samarinda, East Kalimantan. Photo by David Fogarty (August 2014).